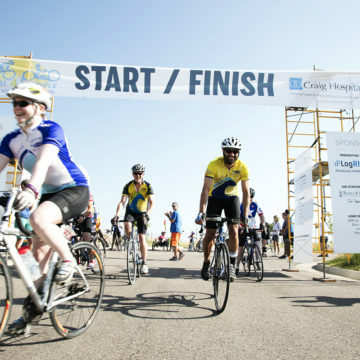 Craig Hospital hosted the 2nd annual Pedal 4 Possible on Saturday, June 18, 2016. The charity bike ride through Boulder County featured courses for all skill levels, including a 10K, 50K, 100K and 100 mile route. The 330 riders raised more than $163,00 for Craig programs and patients. Many Craig Hospital patients and graduates participated in the ride, including Craig outpatient Justin Pines. Pines sustained a severe spinal cord injury resulting in paralysis, broken ribs, a fractured sternum, and a collapsed right lung in a ski accident in Tahoe in April. On the 10-week anniversary of his accident, he rode the 100K Pedal for Possible course on a handcycle. He has raised nearly $18,000 for Craig Hospital from his friends and family. "P4P embodies what Craig's about," says Pines. "When something big and life-changing happens, it is hard to see out on the horizon. Metaphorically, you have to go one pedal at a time and just trust that what's over the next ridge line is going to pan out and that there's opportunity there." "I think everyone gets together and rides for what Craig stands for, the patients and the staff that give everything. I've been very moved by my time at Craig."